You Have Eevolved Into Sylveon! Sylveon is the eeveelution of love. It is short, sweet, to the point, and is always showing affection to its trainer; the “lover of all” Pokémon! Sylveon is gentle outside of battle and spreads happiness naturally. It keeps everyone in high spirits! By getting Sylveon, it shows that you are compassionate and protective. When you try to resolve issues, you do so without the use of violence. You like to talk things out and concern yourself with other people’s feelings – something very appreciated among your friends. You can easily turn a frown upside-down. You are not a pushover, though – like Sylveon, you can be fierce if the situation calls for it. When needed, if your friends or family are threatened, you can ready-up and pack a big punch. Sylveon is a fairy-type Pokémon eevolved from an Eevee. Two components must be in place for this to happen: first, Eevee must know at least one Fairy-type move, and second, it must have at least two ‘affection hearts.’ Affection hearts are indicative of a Pokémon’s bond and affinity toward their trainer. The large majority of the time, Sylveons are male, which comes as a surprise based on its appearance. Only occasionally (about 12.5% of the time) can you spot them in female form. This Pokémon is a mammalian quadruped (it walks on 4 legs), and it’s covered with a pale and cream-like fur. Sylveon’s ears, tail, and feet are a very bright pink – many say that they resemble strawberry ice cream! It dons two very fancy bows; one on the left ear and another around the neck. These bows are a paler pink and have an off-white center. On top of each bow are two feelers, which allow this Pokémon to navigate around its surroundings. These feelers share the same color scheme as the bows, donning blue tips. Overall, Sylveon is very cute. Its short and slender legs allow it to remain both dexterous and corgi-like. Its blue eyes with white pupils are calming, charming, and deep. The origin of this Pokémon is very mysterious. Sylveon is a relatively new addition to the franchise, as it wasn’t present in the first few generations. Most people loved the addition of Sylveon to the Pokémon world. The Pokémon made its original debut in the Pikachu short, Eevee and Friends, and its anime debut under the ownership of Penelope in Kindergarten Chaos! In the manga, the only appearance of a Sylveon is Vuivui. Vuivui is Y’s eeveelution in the battle against Team Flare. In battle, Sylveon boasts an aura that helps calm down its fellow Pokémon combatants. The name ‘Sylveon’ originates from an interesting place. It is a combination of ‘sylph,’ woodland faeries that live in the forest, and eon, referring to an immense and almost immeasurable amount of time. 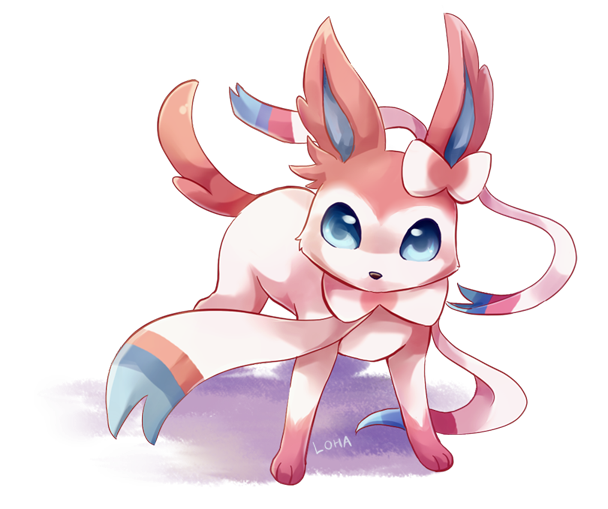 Like all eeveelutions, Sylveon is fox-like, and is certainly a fan favorite. Like most Fairy-type Pokemon, Sylveons are as sweet and as strong as they come – an excellent choice for a trainer wanting to diversify their team.